With the benefit of air miles I had an almost free choice of European flights for some very low prices. I wanted to make a trip in a single day, still with enough time to get a good amount of theme parking in. 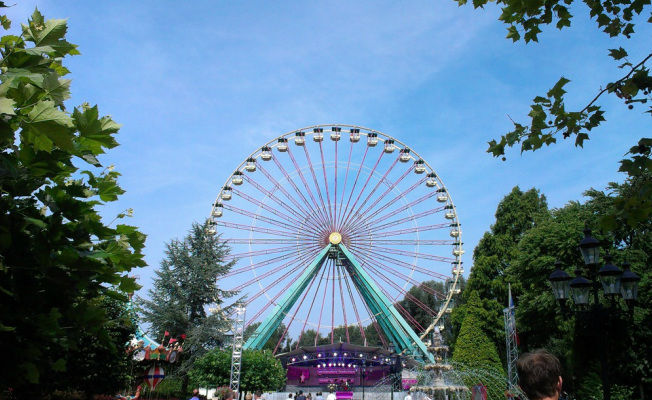 Initially I chose Gröna Lund because of its proximity to the centre of Stockholm, and because of the highly rated Gravity Group roller coaster Twister. I also pondered Europa Park and Efteling, but eventually I settled on Walibi Holland. The park is part of a chain in Europe which is run by Compaigne des Alpes, but before that it was actually a Six Flags park back at the beginning of the 2000s. Eventually Six Flags sold all of their non-North American properties, but the company’s investment is the main reason this park is so good. The park has a plethora of Vekoma roller coasters; A standard Boomerang, Speed of Sound, and the first ever SLC, El Condor, both built pre-Six Flags, and then once Six Flags were in charge they added a wooden roller coaster, Robin Hood, and an LSM launcher, Xpress, which is in fact a clone of the very popular Rock ‘n’ Roller Coaster rides at Disney, in Florida and Paris. The addition that put the park on the international map though was Goliath, a 2002 Intamin mega-coaster. This model is one of the most highly regarded types of steel coaster, and Goliath is no different; it has been regularly voted as one of the World’s top ten steel roller coasters, and it was the main reason for my visit. The trip itself was ridiculously easy; the train station is within Schiphol airport, and after two very empty trains there is a direct bus service from Harderwijk station to Walibi. I arrived at around 12.30, two and a half hours after opening, and so unsurprisingly the entrance was pretty empty. What did surprise me was just how good everything looked. I had heard reports that the park was grotty and uncared for, but the showbiz-style entrance plaza looks excellent. Xpress’s entrance is within the main entrance building, along with some restaurants and a large shop, but as the queue was long I bypassed it and headed to the back of the park. One of the worst things about the park is its layout. Goliath, the signature attraction, is hidden away to the side of the park and it’s pretty much completely invisible until you’re 10 metres from the entrance, which is ridiculous considering it’s over 150ft tall. After a while of winding I reached Robin Hood, the wooden coaster. Although the Sherwood Forest theme is quite well done, there are plenty of medieval huts and archery ranges dotted around, the ride feels rather out of place; it just stretches out into a field with little inspiration. It’s a standard out-and-back layout and it’s quite rough, but on the return stretch there are some decent pops of airtime. It’s not a patch on the CCI equivalents around Europe, but it’s by no means bad. I eventually managed to find the elusive Goliath, but even when you’re in the queue you can’t really get a feel for the ride; all you see is the final bunny hops and the vast lift hill. Under recommendation I chose the front row for my first ride, and I was not disappointed. The lift hill seems to stretch on forever, but the cable lift makes short work of it. The drop is not great, which is usually the case on the front of a ride, but the burst of ejector airtime on the second hill is incredible. I never usually make a noise on rides, but I couldn’t help release an audible “whoa.” The next element is the bizarre Stengel Dive (named after famed engineer Werner Stengel). From a distance it looks like any regular hill, but as you reach the top it twists you almost completely upside down, before twisting back again. On a ride type which never goes upside down it’s completely out of place, but it’s brilliant, especially with the simple lap-bar restraints. There are then two helices, which are fun without being overly forceful, each followed by a twisting hill, lurching you up to the right and then down to the left. Both of these provide a small moment of floating negative g-force. But it’s the finale that really makes the ride stand out; three insane bunny hills. The airtime is simply incredible; you barely touch your seat for the duration, before crashing into a fun s-bend and into the brakes. I instantly re-rode, this time going for the back, and it was even better. You get the full length of the first drop, and although the second hill isn’t quite as good, you get the drop off of that as well. The Stengel Dive is no different, the helices feel slightly more intense, and the bunny hops are arguably even better. I think it’s very safe to say that it has gone straight to my number 1 spot. This trip was also the first chance for me to test out my new on-ride camera which I’ll be using for the new Youtube channel. I was aware that parks often won’t let you video, and I didn’t contact them ahead of time to ask (a rookie error not to do so). Generally the ride operators were adamant that I couldn’t film on the rides, but luckily the op on Goliath was an exception. The woman on Xpress told me that I couldn’t video because then the people who watched it wouldn’t bother going on the ride, as if it were some kind of piracy. It was obviously a ridiculous argument, but even more so because the opposite is true; it’s free advertising for them. I travelled by foot, train, tube, plane and bus for over 5 hours to get to their park mainly to ride Goliath, and one of the reasons for that was that I’d watched POVs of it. Anyway. I’m sure it has more to do with their safety policies, and I did still get a great film on Goliath, which was my main intention. Check out the Youtube channel for an off-ride film of the day! I then headed round to the Mexican themed area, home to the inverted coaster El Condor. As I was getting used to, the area is hidden away, which is a real shame considering that there are some fun family attractions and a rapids ride. However, it would not be a shame if you were to miss out on El Condor. As I mentioned it was the first ever Suspended Looping Coaster built by Vekoma, it’s one of their most popular designs because they’re cheap and they look impressive, but unfortunately they ride terribly. This, being the oldest, suffers the worst. The park have clearly tried to compensate by adding excess padding to the restraints, but all this does is prevent you from moving your head away from them. I spent the duration pretty much doing a pull-up on the handles, and luckily I survived. I took some time to explore the park; the western area is, again, out of sight and was very quiet. The log flume, Crazy River, is excellent and there was a Frisbee ride called Tomahawk which was unfortunately broken, but looked very good. I sneakily got on the kiddie coaster, Rattlesnake (ok, there was no sneaking, I could barely fit in it), and eventually the western area merges into the Walibi Playland. It is as garish as it sounds; an interactive children’s area with water features and a lot of small rides dotted around. The big ride in the area is Speed of Sound, a Boomerang. It’s another ride which Vekoma has cloned dozens of times, but this one is actually rather good. It pulls you backwards out of the station up a hill before dropping you back through the station, through a cobra roll (turning you 180 degrees), then a loop and up another hill parallel to the first. This hill catches you, dragging the train up a little before releasing you and it then does the course in reverse. The ride has been recently rethemed to a cartoonish music studio (which seems to be the general theme of the park), and it’s very well done; one of the hills is completely enclosed with a huge pipe which echoes the music around you. I imagine the ride would usually be quite rough, but special trains have been installed which use a rubber-vest restraint, akin to those on B&M Wing Riders. The final coaster was of course Xpress, which now had barely any queue. The ride is built over a lake so you can’t get very close to it, but it is very interesting to see Rock ‘n’ Roller coaster with no clothes on; it’s a really twisted mess of track. On one hand the Disney version misses a trick being indoors in that there are some thrilling near-misses, especially a very low piece of track on the launch, and you can’t see these at all in the dark. But on the other hand, aside from the launch and the three inversions, the ride does little more than coast around gently, but psychology plays a part in the dark and it feels much more intense. Still, the ride is good, I’d rank it above Florida’s version and below Paris’, and it’s a worthy secondary coaster to Goliath. The day took a lot out of me, but it was well worth doing. The park is much more pleasant than most people make out; the ride ops are friendly (unless you have a camera) and virtually everyone speaks English. Walibi has obviously invested well in the past couple of years to bring it up to scratch, and it has a good number of quality rides. Goliath is simply in a league of its own, and for that alone it makes the park a must visit.